The dispute occurred when two men waiting for a beer became involved in an increasingly fractious argument over the work of Kant – the author of canonical philosophical text Critique of Pure Reason – according to a police spokeswoman in Rostov-on-Don, the town where the argument broke out. The row ended with one of the men producing an air gun and firing several rubber bullets at his opponent. Police did not identify the men but said that the gunman had been detained after fleeing the scene, while the victim was in hospital with non-life-threatening wounds. The attacker now faces up to 10 years in prison for intentional infliction of serious bodily harm, police said. It is not known which of Kant’s many theories was the subject of debate. 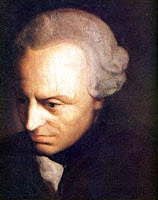 Kant was born in Königsberg in the Kingdom of Prussia in what is now Kalingrad, Russia, in 1724.